Guest post by Toby Beresford at Leaderboarded. If you’re embarking on a new gamification project it’s worth answering up front the question, am I ready to handle failure? Gartner predicts that, similar to consumer games which is a “hits” business, there will be four gamification flops for every one “hit” program. How will you ensure that your gamification project is one of the hits? Or, if it’s one of the flops, how will you ensure that you haven’t burned your entire budget and that you have breathing space to try again? One approach is to take a leaf out of the Lean Startup movement and launch with a Minimum Viable Product (MVP), get early validation of your program design, and iterate based on real world experience. Gamification is often portrayed as a heavyweight science. Elements such as multiple currencies, levels, badges, leaderboards, goals, missions, and achievements add up to a lot of moving parts. For me, these features reflect the super rich environment of a mature game, not a fresh one. Too many gamification designers offer their players all the paraphernalia of a mature game on day one, rather than focusing on a minimum viable set of mechanics and aesthetics. So what is the MVP for a gamification project? 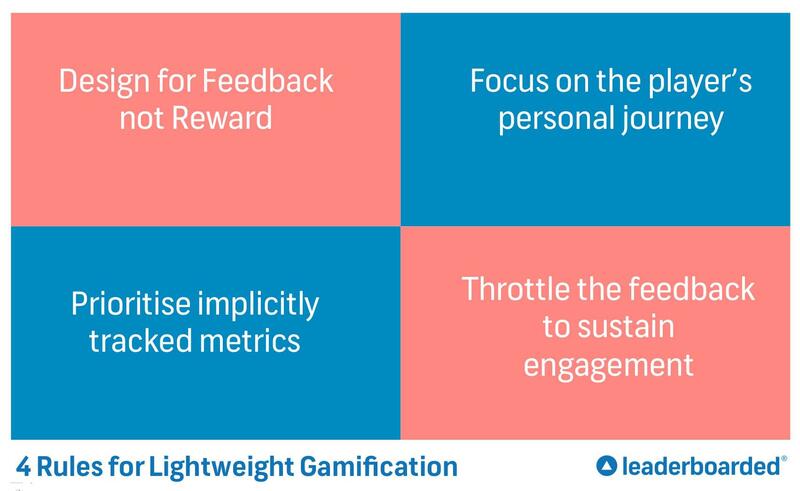 In my “lightweight gamification model,” introduced at a GamFed meetup earlier this month, I outline a simple approach that gets you up and running with little fuss. 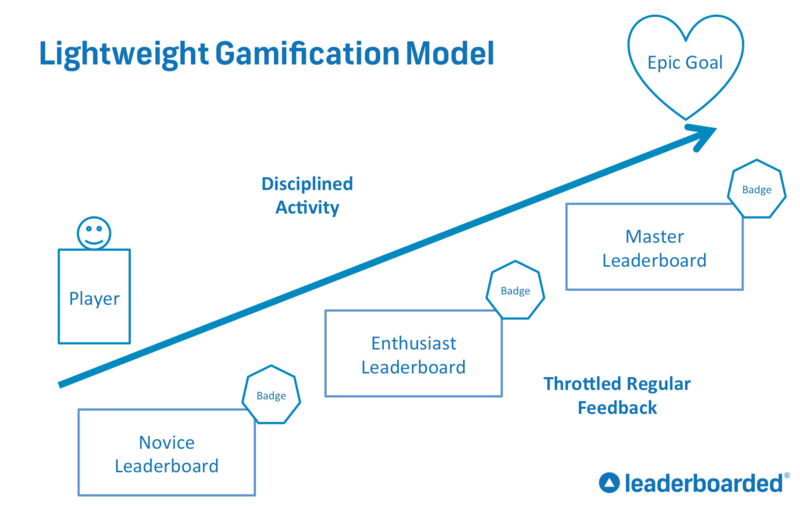 Lightweight gamification is best understood in two parts – ‘the 4 rules,’ and a diagram that you can use to draw up your own gamification solution. I find that rule one and two means that we focus our design (and player attention) on what many gamification mechanics are really good at – providing fast, granular feedback to help us on our journey – and not on what some take them to be – an extrinsic reward worth having in and of itself. When launching a gamification initiative, my working assumption is that my target audience is super busy and fairly uninterested in me and my project. Even if you’re the CEO, you’ll probably find yourself in a similar position when trying to roll out an initiative. Most people are too busy to be disciplined – that’s why we can help them with our gamified service. With this background in mind I then develop my gamification service design to reflect this. In fact, lightweight gamification requires less effort by both manager and player. We achieve this by prioritizing metrics that do not require new behaviours by the player (rule three). That means we don’t direct them to specific pages or pop up areas that ask them to do something new. 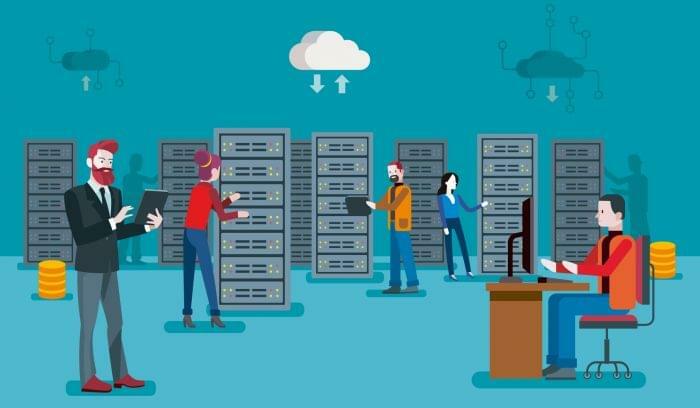 That’s one of the reasons I use a lot of social media signals in my projects – most players are already using social media for conversation with colleagues and customers, so its easy to listen in. Rule four is counterintuitive but is perhaps the most powerful within lightweight gamification. Throttled feedback entails giving less feedback than heavyweight gamification, but still more than your players are probably getting today. That means a weekly email letting players know their current score, where they stand on the leaderboard, and what changes occurred since last week’s stats. This approach is habit forming and carves out a space in someone’s busy schedule for your program. It gives them a point in the week to stop and think about their performance and identify ways to improve next week. 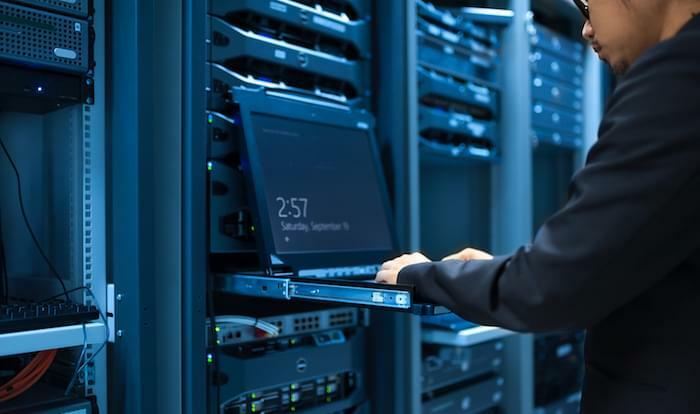 Throttled feedback doesn’t have to be weekly – it could be hourly, daily, monthly, or quarterly, but the main thing is that it isn’t real time. Our players just aren’t that engaged, nor do we want them to be – we want them to be engaged in what they are already doing and give them feedback every so often to help them on their way. 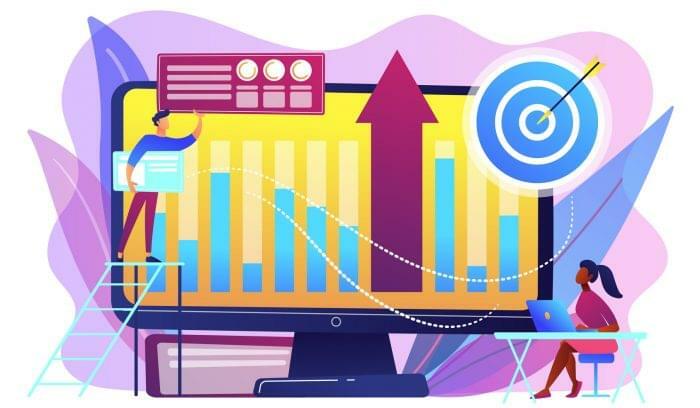 Lightweight Gamification is already in use in many campaigns running on the Leaderboarded platform – a good example is the Exaleague of Tech Startups where three leaderboards and weekly feedback helps startups achieve social media marketing success. 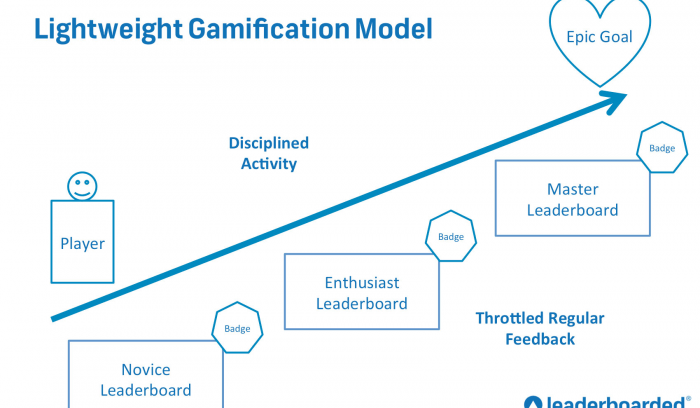 The lightweight gamification diagram is designed for you to use and sketch out on a whiteboard or on a piece of paper with colleagues. At its heart is the player journey that they are already on. Each person wants to achieve their own epic goal within the project you’re gamifying. To start, focus on just one journey and one epic goal. In a health and wellness program, for example, you might focus on ‘getting fit,’ losing weight, or eating better. Whichever goal you choose you must be able to easily imagine your players already wanting to achieve that. If you’re unsure what their intrinsic motivation is, then maybe you need to go out and ask them! Some people don’t differentiate between intrinsic and extrinsic motivation (“I’d like to earn more money”) so their goals might need unpacking, rather than being taken at face value. Once you know what the player journey is, it’s time to identify what activities you’ll give feedback on. In lightweight gamification you can achieve this with three leaderboards – one for the novice, one for the enthusiast, and one for the master. Each leaderboard can track slightly different activities, which are relevant to the player’s level. Lightweight gamification condenses your gamification program design to a minimum viable product – all you need is an epic goal and three leaderboards! If you’d like to get started with designing your own program you can download this handy blank copy of my lightweight gamification model so you can fill in your own ideas.